Ceremony is ranked 2nd best out of 8 albums by Spooky Tooth on BestEverAlbums.com. The best album by Spooky Tooth is Spooky Two which is ranked number 6456 in the list of all-time albums with a total rank score of 246. Members who like this album also like: The Two Sides Of Tony (T.S.) McPhee by Tony McPhee, Phantasia by Phantasia and Tago Mago by Can. Related links: top tracks by Spooky Toothtop tracks of the 1960s, top tracks of 1969. The first gospel metal album! ;) Seriously, it does sound strange to say the least, not like a bluesy, gospel album. Maybe not dishonest, but "irreverently reverent" you could say, they're singing humble, faithful words, but with an aggressive, self-faith. That's the Spooky Tooth side of it anyway. Some said Pierre Henry's "background noises" ruined it, but I don't know that a heavy metal mass like this, by itself, would be interesting enough. What Pierre's strange noise and speech adds to it and has to do with religion is hard to say, I think maybe it gives an impression of what's really on in the congregations' minds as they're paying lip service to God. The one I found most amusing was the blubbering voice, synchronized with the guitar riff on "Jubilation". 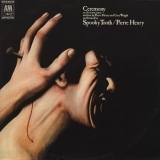 So I understand, neither Spooky Tooth nor Pierre Henry were very happy with the album and I don't think either of them really cared for the type of music that the other did, but today I find the album interesting and a good listening experience. A very experimental record. Challenging but rockin', love it! Totally different from all their other lp's, and unlike any other lp by anyone. Sounds like a rock band performing in a cathedral next to a building site. Amazing and brilliant.